I use the term unanticipated rather than unexpected because I should have expected these to appear but one of them I didn't notice, and the other one I had written off as unlikely. When writing about the new Star Wars booklets I concentrated on the fact that the booklets we had received had the SBP2 printing in different orientations, which is interesting even though we don't intend to sell the two types of SBP2 separately. What I overlooked was the low number of mixed-content (MCIL) booklets this year, and the fact that the only other two - Windsor Castle and David Bowie - were printed on SBP1! 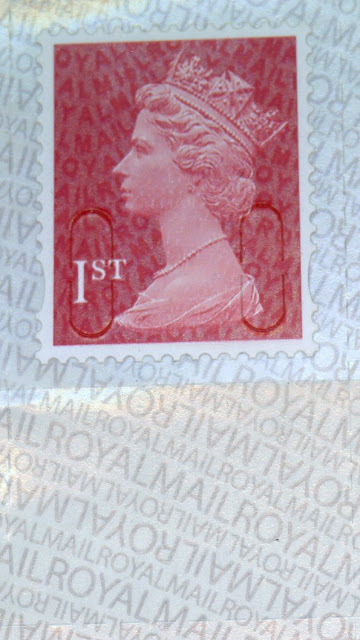 Back in the spring there were reports that the first counter sheets on paper with security printing on the backing paper were printed on 09/12/16, and a 1st class example was pictured in Stamp Magazine. Needless to say, none were found in post offices, and the M17L printed 27/02/17 appeared in April. Collectors and dealers don't know whether Post Office Distribution Centre at Swindon has any specific way of storing and issuing stock (though we have long believed that it is random!) but it appears that the 2017 stock was stacked on top of or in front of the 2016 printings - which have now come to light! The ones found were printed on 12/12/16 (a Monday), whereas the one shown in Stamp Magazine was printed on the Friday. The 1st class deep scarlet counter sheet M16L has been listed in our checklist as 2914a.6 just for the record. Few sheets have been reported so far, so it's unlikely many dealers will have them - although we await more reports. It will be listed in our shop using this number as soon as we have supplies to offer. At the moment we can only show this picture. Maybe they will find some 1st class large Deep Red counter sheets with M16L code, who knows?